The information here is from first-hand experience. 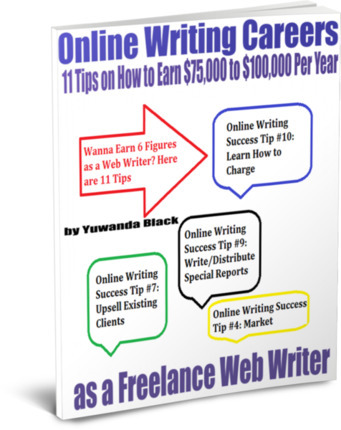 It is to help existing/aspiring web writers who want to leearn how to earn upwards of $100,000/year, which is pretty easy to do as a web writer. Now, most of them paid slave wages (eg, $3 for 500 words), but there were so many of them that it forced me to do some digging to find out what this freelance writing niche was all about. Once I did, I knew I could make a go of it. So, I wrote an ebook entitled, How to Make $250+/Day Writing Simple, 500-Word Articles. Once this ebook was published, it was like it made me an instant “SEO writing guru,” and even more questions poured in. So, I started a blog specifically for freelance SEO writers (http://SeoWritingJobs.com). Week in and week out, questions are asked and answered there, and it’s become a go-to source for new and aspiring SEO writers. Hence, the information here is for existing/aspiring web writers who want to know how to earn upwards of $100,000, which is pretty easy to do. Proof? I don’t think I mentioned this to you before, but I currently live with my wife’s family in the Philippines. We moved here out of necessity-we are adopting a non- orphan child and the only way to complete it was to live in this country for 3 years before starting the adoption. For most of the time here, we’ve been living off our savings, while I’ve been searching for a way to make money online to help support us. Thankfully, a friend I met in one of the forums recommended your ebook [on SEO writing] to me and has been mentoring me on much of the details ever since, which has helped me to reach the point now where I have consistent weekly cash flow. The reason I mention all this is I wanted to know what you know about the tax implications of living abroad. I have heard that if you are a US citizen and you live abroad, you are exempt for like the first $90k or something in income. This has never been an issue in the past, but this year it definitely will be. I was wondering if you could post sometime about how you handle your taxes and if you are able to qualify for this tax exemption. I want to point out that this freelancer started his SEO writing career in and around November of 2010. I’m writing this ebook in November of 2011. So, it’s totally possible to earn six figures your first year in this business. I know you write a lot about marketing etc., etc., but I am really curious to know what you did to make your first 6 figures and how long did it take. Did you have a strategic plan, or just wing it? I am really thirsty to hit the 6 figure mark within the next 6-12 months. So, following are my keys/insights/tips to how to hit the six-figure mark as a web/SEO freelance writer. Note: Although the discussion here centers around SEO/web writing, the advice is applicable to any type of freelance writing career you want to start – online or off.